Stunning, modern self-contained luxury villa in the picturesque and peaceful surrounds of Encounter Lakes. 3 bedrooms with built in robes. Sleeps 6 comfortably with 2 queen beds, 1 double bed and 1 single mattress if required. 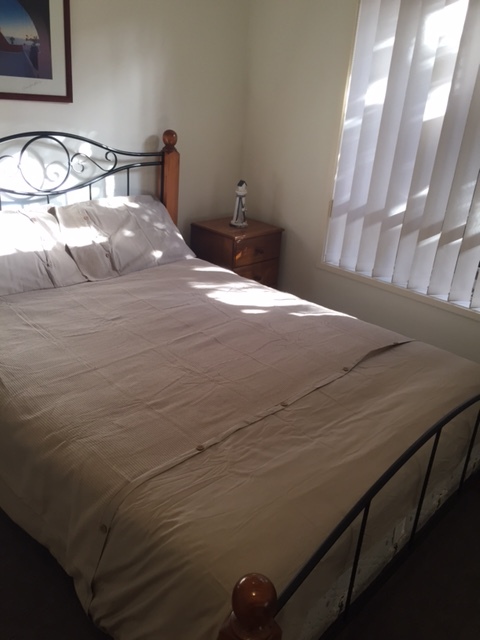 (NEED TO BRING OWN LINEN OR LINEN HIRE AVAILABLE for $10 pp for duration of stay from owner: Steale- Mobile 0419 868 143) Spacious and comfortable lounge/family and dining room, large outdoor undercover entertaining area, fully enclosed fencing and off street parking. On Cancellation of a booking the owners may retain all monies paid if the property is not re-let for this period. All service changes/cancellations will be subject to a minimum $50 AUD cancellation / administration fee. Cancellation notified 30 days or more prior to arrival date will be entitled to a refund of the deposit / money paid less minimum $50 AUD. Full payment is due for bookings within 30 days of arrival date; failure to arrange payment will result in cancellation of the booking. Cancellations notified 30 days or less prior to arrival date and where the guest has entered an agreement to make final payment on the day of arrival the guest remains liable for the full payment. Payment will be invoiced to the guest and / or charged to any security held by this service. Cancellations notified 30 days or less prior to arrival date will forfeit the full deposit / money paid. When a booking has been made 30 days or less prior to arrival date and cancelled the full deposit / money paid will be forfeited. DAMAGES / SMOKING / CLEANING POLICY All services booked through bettarates.com are subject to an accidental / willful damage policy a no smoking policy and an excess cleaning policy. Where the individual services confront interruption to business or unreasonable delay and expense in business operations the responsible guest will be charged accordingly. Travel insurance is recommended for all bookings to provide adequate protection against cancellation of travel. Bettarates.com is not responsible for changes errors omissions or misrepresentations made by owners operators or third parties booked through bettarates.com.